Former Wisconsin Gov. Tommy Thompson endorsed his one-time GOP presidential rival Rudy Giuliani on Friday, saying the former New York mayor is a winner who can beat Hillary Rodham Clinton. "I want a candidate who can lead and bring America together," Thompson said with Giuliani by his side in this early voting state. "I want a candidate that's going to be able to stand up and be able to win the Republican primary and take on Hillary Clinton and win," added Thompson, the first former 2008 Republican candidate to make an endorsement. Thompson served as secretary of Health and Human Services during President Bush's first term and entered the GOP race earlier this year. But he struggled to raise money and gain support in other states with early contests such as Iowa and New Hampshire. "I was a candidate for president of the United States and I'm sure most of you didn't even know it," he said to laughter from a crowd of about 150. Thompson dropped out of the race in August after finishing sixth in a test vote in Iowa, which holds the nation's first caucuses. He said he got to know the other candidates during his brief run. "Rudy Giuliani is a leader," Thompson said. "What I like about him is he is a reformer," he added, saying Giuliani cut welfare rolls, reduced taxes and reduced crime in New York. The two don't agree on some issues, however. 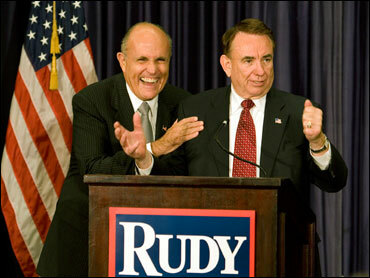 Giuliani supports abortion rights. Nobody finds their perfect candidate, Thompson said. "If in fact I have to wait around for the perfect candidate  I thought it was me and I lost  I'm going to have to wait another five years," he said. Giuliani said while he was mayor he borrowed ideas Thompson used in Wisconsin. "His endorsement means a great deal politically. His ideas mean a great deal substantively," Giuliani said. Thompson said he spoke to several other GOP candidates before making an endorsement. "I looked at the record and the record from Mayor Giuliani was extensive, complete and very, very good," he said. It's not clear what the endorsement will mean to Giuliani. The former mayor could use the Midwesterner's support to try to mollify skeptical Iowans and others worried about his moderate-to-liberal views on social issues. But Thompson himself didn't himself have much support in Iowa, languishing in the single digits in polls and barely registering in national polls. Earlier in Columbia, Giuliani kept up his criticism of Democratic rival Clinton. The New York senator has "never run a government. She's never run a state," Giuliani told several hundred homebuilders and real estate agents. "She's never run a business." During a morning speech Friday in Columbia, Giuliani kept up his criticism of Democratic rival Hillary Rodham Clinton. The New York senator has "never run a government. She's never run a state," Giuliani told several hundred homebuilders and real estate agents in this early voting state. "She's never run a business." As if addressing Clinton, he said, "You've never met a payroll. You've never had the responsibility for the safety and security of the people on your shoulders." Of himself, he said, "I've run a lot of different things." He also called for limits on lawsuits and cited a recent case in Washington in which a lawyer sought $54 million after a dry cleaner lost his pants. The lawyer lost the lawsuit, but the family that owned the business sold it, citing loss of revenue and the emotional strain of defending the case, the family's attorney has said. "You should have to pay for the damage that you do in bringing a frivolous and phony lawsuit. We've got to start creating an incentive so that people don't bring the frivolous lawsuits," Giuliani said. "Simple fact is we sue too much in the United States of America."